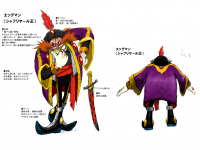 King Shahryār is the alternate doppleganger of Doctor Ivo "Eggman" Robotnik within the world of Sonic and the Secret Rings. Upon first meeting Shahryār - and noting the King's resemblance to his great nemesis - Sonic is naturally suspicious of the obese sultan and seems apprehensive in trusting him. However, as the story progresses, it becomes apparent that Shahryār really doesn't share the grandiose megalomania of his alternate self (or the other alternate self), and instead the King in fact serves as a minor ally for Sonic in his quest to thwart Erazor Djinn. In the real-world myth, King Shahryār was the listener to whom Šahrāzād told the 1001 stories that make up the Arabian Nights. This page was last edited on 3 October 2018, at 14:29.